Konsta Punkka feeding a squirrel in Helsinki, Finland. It was a sunny September morning in Helsinki, Finland, and my two girls and I were desperately trying to find the correct bus stop, where to take the bus outside the city to meet with photographer Konsta Punkka, the “squirrel whisperer” KPunkka of Instagram. Konsta is an Instagram sensation, who has over 115,000 followers admiring his daily nature photos, mainly of squirrels, birds, and other wild animals. Instagram fame is a big deal for anyone, but for a Finn, this is a huge deal – he already reaches one third of the readership of the major newspaper in the country. Of course, Konsta’s followers come from all around the world. Once we get to the last stop of the mysterious bus route to Konsta’s secret squirrel location, the girls and I are starting to understand why Konsta started coming to the location already for three years. It’s calming, a mystical island, and you’d never guess how close to the city you are. Katja: Do you have an Instagram strategy or do you post more intuitively? Konsta: I use analytical tools, like Iconosquare, to analyze when my photos get the most likes and that sort of things. You have to know quite a bit about Instagram, if you want to get on the top. For example, Instagram likes that you use their own filters in the photos, and your photos are more likely to be featured on the popular page when you use Instagram’s filters instead of editing them on other programs. So sometimes I don’t edit my photos like I normally do, but use the Instagram filters or edit using Instagram editing tools instead. Konsta photographing birds in his secret location in Helsinki, Finland. Katja: I have other Instagram-famous friends, and many of them get a lot of negative comments on their photos. Although Instagram is a much more positive community than let’s say YouTube or Facebook, there are still a lot of trolls. How do you deal with negative comments, or do you feel the community is supportive of what you do? Konsta: I haven’t really gotten any negative comments on my photos. I mean, it’s cute squirrels and birds, everyone likes that, right? My topic isn’t really something that attracts negative comments, and my followers are all nice people. I think Instagram community is very supportive, and only what I have gotten is constructive criticism to make my photos better, but that has been great to receive so I can improve my photography. Squirrel whispering takes a lot of patience. Katja: You are not a typical 20-year-old college kid. What do your friends and family say about your nature photography passion? Have they been supportive? Konsta (laughing): Yeah, most of the young guys my age don’t spend their time the way I do. I usually get up before sunrise on Saturday mornings to come and photograph right after the sunrise when the light is the best. Most of my friends are still sleeping long after I wake up. I don’t usually shoot during the day, only early on the mornings and around sunrise on the evenings, so I have time to see my friends, and do other things during the day. My friends and family have been very supportive. Although I think my mother was a little worried during my last year of high school when I was spending a lot of time with the squirrels instead of reading for my matriculation examinations, but after I graduated with high honors, and got into a photography school, she hasn’t been worried. Now everyone can see this is what I want to do – and I am already doing – professionally. Katja: Can you tell what’s your secret for squirrel whispering? Konsta: I’m really excited that I was able to show you today, that anyone can really do this, and you and the girls were able to feed the squirrels and the birds as well. The secret really is patience. I have been coming to this location for three years, and for around a year I came here almost daily to earn the trust of the animals. Now I have squirrel friends, like Snok, who sometimes even sits on my head. If you want to start squirrel whispering, start where people already might be feeding them. For example when I started coming here, there already were a lot of grandmas who were also coming here several times a week to feed the animals. This is much more difficult in wilderness, where animals have a lot of space to roam. Start in city parks, or close to where people live. Even your own backyard. Katja: Can you tell us some of your future dreams after you graduate from the photography school next spring? Konsta: My dream would be to move out of Finland and find a job or a place to study more photography somewhere in Europe, but also experience life and see the world outside Europe – with my camera of course. For example one of my wildest dreams would be to work with National Geographic, or do any kind of projects with NatGeo. I want to continue on Instagram, and take it even on a more professional level. Katja: How do you define Skimbaco Lifestyle? What is living life to the fullest for you in your everyday life? Konsta: The everyday highlight for me is to walk in the nature, and get in the touch with the animals. I like to go to the nature to relax. And of course, eating candy is the best what you can do every day. 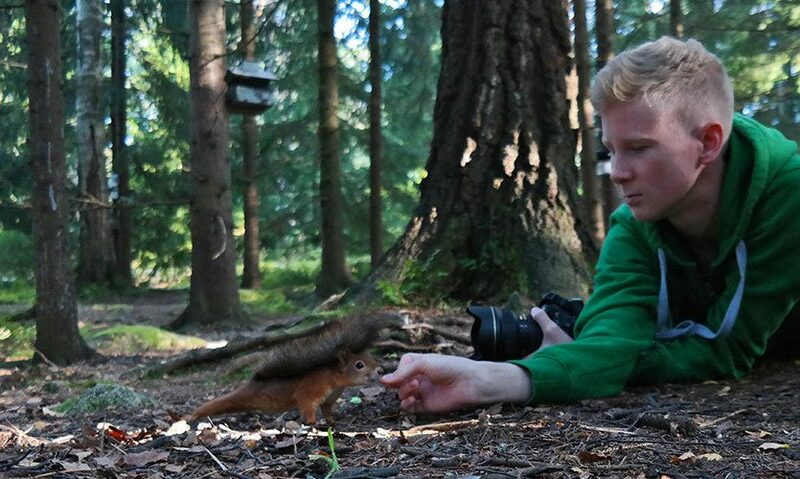 What about our squirrel whispering day with Konsta? 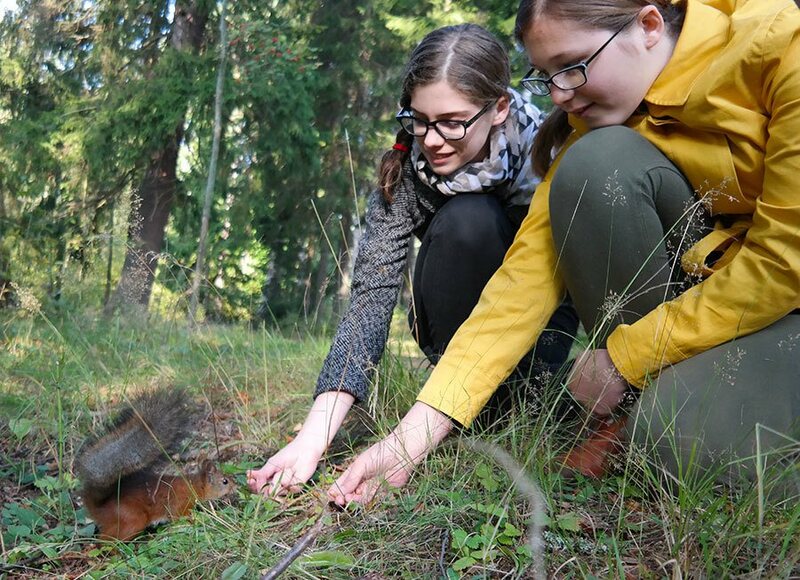 My two daughters, Isabella, 14, and Gabriella, 12, both visited Finland with me on a work trip, and one of the many highlights for them was to get to know Konsta (we had already spent a few days Instagramming a coastal town Porvoo together with Konsta), and visit his secret squirrel park. 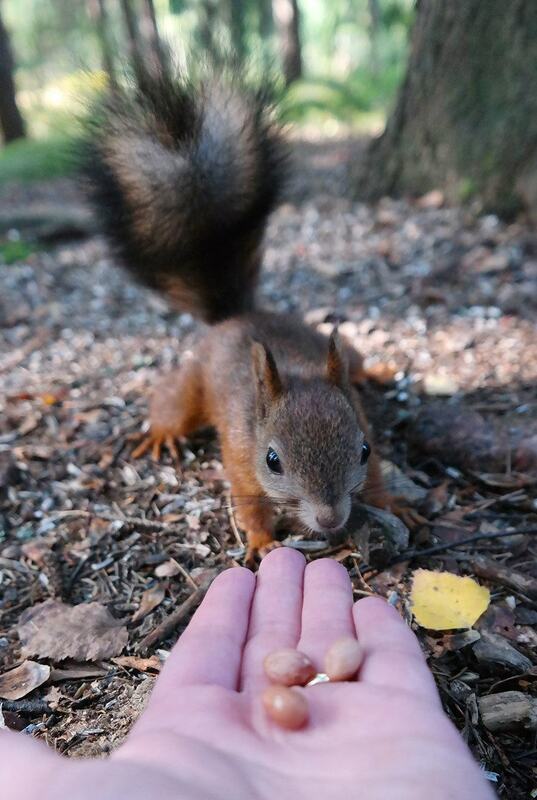 Thanks to Konsta, even we were able to feed the squirrels! I am used to photographing travel destinations, and often you move fast to capture the moments as they happen, and sometimes even run to catch a moment happening. There was none of the hurry in the nature photography session we had with Konsta. We walked fast in the forest to find the best spots, but once we got to the feeding areas, there were no fast movements, no loud speaking, just calmness, and completely being in the mercy of the forest and its animals, and just patiently waiting. 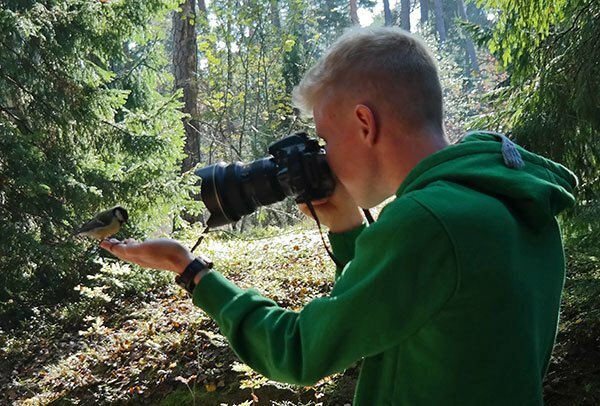 Feeding the animals is one thing, but taking photographs of it while you are feeding them is another one, and the difficulty of it really made us to appreciate the talent Konsta and the other nature photographers have. Often the window for taking the shot is measured in seconds, and then the moment – and the animal – can be gone forever. However, with Konsta’s help, we too were able to take some photos. Isabella even took this video of her feeding a squirrel. Yes, it’s true, even I was able to feed the squirrels! Before we said our thank-yous and parted with Konsta, Isabella and Gabriella had one more question for him. A question he wasn’t too happy to hear, and he just shook his head for an answer. The girls were teasing Konsta and asking if he was a Disney princess in disguise (and if the squirrels and birds were also cleaning his room). It would make sense that some Disney magic was involved, but as we experienced it ourselves, all the magic we saw was Konsta’s calm appearance, love for nature, and the animals responded to that. Disney was not needed. A squirrel whispering and wildlife photographing workshop with Konsta Punkka on Saturday 27.9 in Helsinki Finland. If you live hear or you’re currently visiting here join the fun! It’s for all kind of nature lovers and photographers. Contact Konsta via email: kpunkka@gmail.com for more details. And of course, connect with KPunkka and Skimbaco on Instagram. Really nice interview! And wow that you got to feed the squirrels too!!! Oh, his pictures are gorgeous!! What a lovely experience for you all. 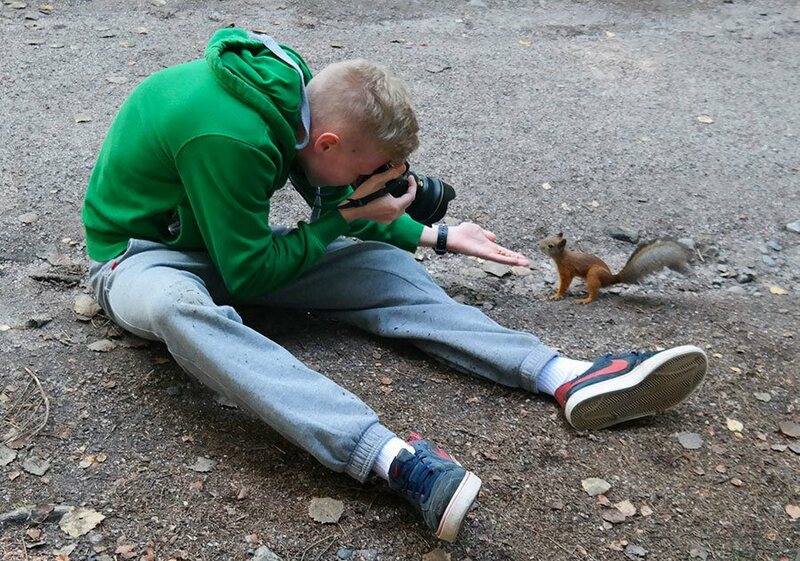 I’m so glad we live in a world where it’s possible to obsess about taking photos of squirrels in Finland and that can turn into career opportunities – it’s wonderful! Lovely article! :) It is fantastic how many ways you can earn a living.